TO FREE OR NOT TO FREE, THAT IS THE QUESTION…. On the way back from the cricket last week, I stumbled upon an interesting article in a freebie magazine on the plane, an article which had I read it a couple of weeks ago, may have had an influence on my latest fashion dilemma. Unbelievably, according to the latest French research, going bra less is actually better for your boobies than trying to hinge them up in M & S’s finest and apparently, left unattended, they will naturally learn to support themselves! Well that’s ok then and if anyone reading this is brave enough to give it a go, please let me know how you get on, for a few weeks ago I experienced another fashion dilemma which again was not an easy one for a woman of a certain age as unlike the shorts issue, where really, the decision not to purchase was the obvious one for any woman with an ounce of pride, this one was a little trickier. In yet another act of rebellion, (woo hoo, I know, get me), I purchased a very nice black jumpsuit from Top Shop which I decided I could wear to a black tie dinner. The dress code was short cocktail dress but I felt I should practice what I’ve been preaching and opt for an outfit that I actually liked and felt comfortable in. If any one complained I reasoned, I would declare that I batted for the other side and see what they had to say about that! Anyway, that turned out to be the least of my problems, as the very nice jumpsuit actually had a very low back ,which, I concluded, called for some seriously off piste underwear. But, hey, I was in Glasgow, style capital of the North, if Glasgow didn’t have a solution, no one would. And so it was that I set about the task of finding suitable cladding for my upper regions, a task that frustratingly turned out to be a lot more difficult than anticipated. What actually amazed me was the fact that there really was so little on offer. To be honest I don’t really know what I expected but I expected a little more than the stick on item I was eventually forced to purchase. Don’t get me wrong, the sales assistant was very helpful but I would now like to get her to elaborate on the ceilidh she attended while wearing the aforementioned contraption as I can’t believe she can have moved much or raised her arms above shoulder height. For when I finally hit the dance floor later on that evening, all hell broke loose and trying to dance with your arms clamped to your sides isn’t a great look for the Queen of Ibiza. To be fair to her, she had suggested that the easiest option was for me to just swing free, as it was obvious I wasn’t built like Jordan and the outfit was black and high necked, but once again the age thing reared it’s head along with the fear of some of the male members of our party finding out that I had gone commando. Wearing trousers to a black tie do was one thing, going bra less was probably pushing things too far. So sadly, I didn’t do much dancing and to be honest I’m a little cross with myself for not being quite the free, liberated spirit after all as by that time of night, even if I had whipped off the offending item, no one would probably have noticed and my wee boobies could have swung joyously free to the beat in the aptly named Swing Club. ( that’s Swing club by the way, not Swingers…it hasn’t come to that yet!). So if anyone out there has the answer to my problem, please let me know, as I really cannot believe that the fashion world hasn’t come up with something suitable that doesn’t involve sticking on or strapping up, unless of course a low backed jump suit isn’t meant for the un-surgically enhanced older woman ,who if she dares to shop in Top Shop has to live with the consequences. DOES MY BUM LOOK APPROPRIATE IN THESE? I may be having a midlife crisis but I know where to draw the line when it comes to buying a pair of shorts. 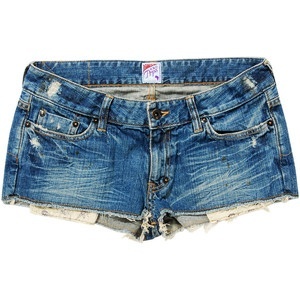 Short shorts, for those not in the know, are those skimpy little numbers offering a tantalising glimpse of a well toned bum cheek and quite honestly, unless you are an ex supermodel, they are just not appropriate for a woman of my age. The problem is, the shops where I live are full of them and there doesnt appear to be much else on offer other than a bit of sensible, middle aged, knee length tailoring. Apparently, one of the first signs that you’re approaching a midlife crisis, is the hiring of a personal trainer and I am not afraid to admit that Jim my personal trainer has made a huge difference to my life. I’m now fitter and stronger than I was ten years ago and I’m hopeful that I have managed to stall the ravages of time for just a little longer and not go shuffling sadly into my twilight years. If I drop dead tomorrow, however, I will be well pissed off but as Jim so nicely put it, at least I’ll look good in the coffin and I won’t need to supersize! Anyway, back to the shorts. As a consequence of being abused (sorry, encouraged) by Jim and his circuit training, I think my legs are in quite good shape. I have dieted, exfoliated and anti cellulited, (Temple Spa do a mean anti lumpy bumpy cellulite lotion) and body brushed, massaged and lathered myself with aromatic oils. But as I stand next to a nubile, taught skinned teen something in Top Shop who probably thinks I’m shopping for my daughter, I know I’m kidding myself. .Mutton dressed as lamb springs to mind along with visions of Madonna depressingly clad in black leather and if Mr Derbyshire saw them he might actually ban me from going. I might be heading to Ibiza with a sister who has just accidentally dyed her hair orange but I know my limits. Smiling maternally at the nubile, I place the offending items back on the rail. I think I’ll leave the short shorts to the gorgeous leggy Amelia and on this occasion act my age.